Seven time MotoGP champion, Valentino Rossi, has signed a contract extension with the Movistar Yamaha MotoGP team. This means that the 39-year old will continue to race for the team through the 2019 and 2020 seasons of the MotoGP championship. This announcement by Yamaha comes before the first race of the 2018 season in Qatar this weekend. Rossi will continue to partner his current teammate Maverick Vinales who also signed a deal with Yamaha earlier this year to stay with the them until 2020. The pair will be seen riding a heavily updated 2016 YZR-M1 after the less than ideal success of the 2017 bike. Rossi made his MotoGP debut with Honda in 2002 and is considered one of the most successful motorcycle racers of all time. He signed with Yamaha in 2004 and has raced for the team since, apart from a two year stint with Ducati in 2011 and 2012. This partnership has yielded 56 of his 115 career wins as well as the 2004, '05, '08 and '09 MotoGP titles. His first win with Yamaha came in his first outing with the team in South Africa in 2004. No mention was made of his retirement plans although Rossi was careful to reiterate his that passion for the sport remained undiminished. His decision to continue riding with the Yamaha team up to his 23rd season in top-tier motorcycle racing seems to stem from the close relationship that Rossi seems to share with the engineers and other support staff in the Yamaha team. 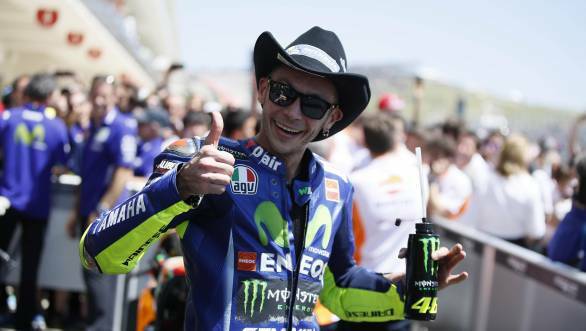 This news should also be well received by fans of the sport, as Rossi has remained enormously popular despite a lack of championship wins in recent years.